Many women need donated eggs. A shortage of good quality eggs can be as a result of age or a genetic condition or it might be that surgery or medical treatment has damaged the ovaries. IVF treatment with donated eggs overcomes these issues and offers excellent success rates. Now Bourn Hall is offering free egg freezing to women prepared to share their eggs to reduce waiting times for donated eggs and increase choice for recipients. The decision to use donated eggs is not an easy one, and it is not uncommon to feel a sense of grief that you are unable to conceive naturally with your own eggs. Counselling is an opportunity to talk through these feelings and also offers a safe space to discuss the implications of having IVF with donated eggs and how you might explain this to your child and wider family. If you decide to go ahead, you will be matched with a suitable donor and able to access some information about them but you won’t be able to find out any information that might reveal who the donor is. If you’re having treatment at a licensed fertility clinic in the UK, your donor will have no legal rights or responsibilities to any children born as a result of treatment with their eggs. They won’t be named on the birth certificate and have no legal, financial or moral responsibility for the child. In addition to an altruistic donation programme Bourn Hall offers the opportunity for patients with particularly healthy eggs the opportunity to share eggs they don’t require for their own treatment. These patients are given a benefit in kind with a cycle of free IVF and for many this makes fertility treatment more accessible. However, there is always a shortage of donated eggs and until recently the treatment cycles of the woman receiving fresh eggs needed to be timed with those of the woman donating or sharing her eggs. 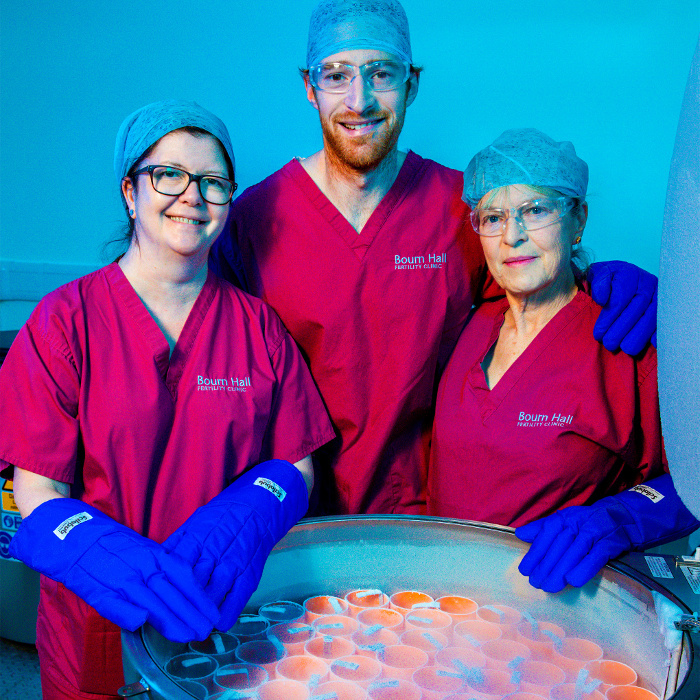 To overcome this problem, Bourn Hall has introduced a state-of-the-art freezing service and egg bank that is offering the opportunity for more women to freeze their eggs. If you are unable to view the video above you can watch it on YouTube here. Thanks to the use of vitrification techniques egg freezing is now a very successful procedure; birth rates from using frozen donor eggs are now in line with birth rates using fresh eggs in IVF. 1. Overcomes issues of going abroad for donated eggs, where donors are not recruited under UK rules and regulations. 2. More flexibility as recipients cycles do not have to be synchronised to their donor’s treatment cycle. 3. More robust screening as eggs will be quarantined prior to release. 4. Greater choice of donor eggs. 5. Ability to choose how many donor eggs to use. 6. Encourages donation as patients willing to share some of their eggs in return for reduced price treatment can start immediately rather than having to wait for a suitable recipient. Egg freezing is still relatively recent and only 2,000 babies have been born worldwide from frozen eggs. Advances in cryopreservation techniques mean that Bourn Hall has confidence this procedure will become as robust as the freezing of sperm and embryos and will offer those in need of donated eggs shorter waiting times and greater choice. Launch of egg freezing programme. Egg freezing for fertility preservation. Thinking about freezing your eggs?